(See Above) Today the market spent most of the session moving to the downside but towards the end of the session with just one hour to go – we popped back into the close giving us a half-baked “V-Reversal” Day. (A True V-Reversal usually either takes a big winger to the downside, or makes a strong parabolic move to to the upside before reversing at some point mid-day and returning all the way back to the starting point.) We faced heavy volatility and extreme chop right out of the gate you will see expressed in all that negative tick tick traction in 4 of the 8 trade alerts. Today was more like a shoot-out at the OK-Corral rather than the nice smooth price action that we obviously prefer. I had mentioned early on in the Market Commentary section to “fasten your seat belts” and prepare for a potential day of trench warfare as the market came back online after the 3-day Memorial day holiday and that is precisely what we got. 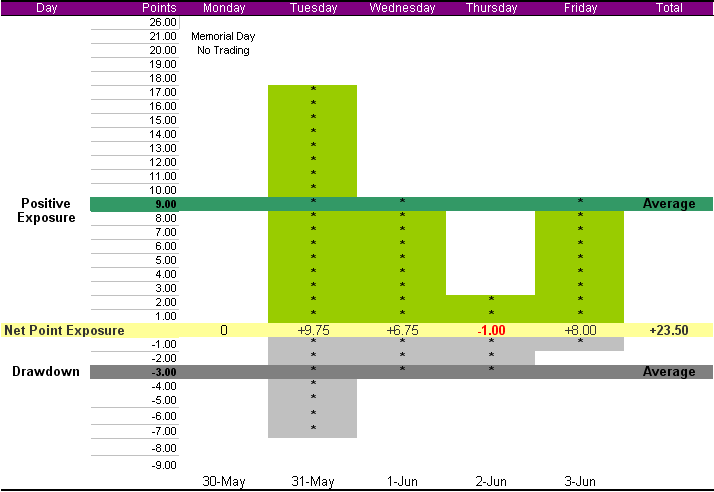 Three of the trades got us to a guaranteed 1-point delta target or a no-lose position. On several of the other trades the system tightened the stop to prevent full stop-outs and we were able to scratch out with only a few of drawdown. In the end the system exposed us to almost 10-points of positive tick traction or 2.5 times greater than negative although it was a battle field for much of the day and any net points you ended up with were hard won. Remember the job of the Momentum System is to get us to the front lines of the battle. Our job as traders is to determine if and when (and how aggressively) we want to join the fight. (See Above) Today was one of those days where the stars just didn’t line up for us. The market rapidly broke-down out of the morning quicksand zone which was running from 2090.00 to 2096.50 but the sellers fizzled and price retraced right back into the zone. After clanging around in the bottom section of the quicksand zone for a time, the buying started to pick up steam and the market attempted several breakouts to the upside which the Momentum System Alerted us to. There were 3 attempts and in the end none of them followed through. Buyers fizzled and sellers hit hard on the breakouts. The System issued stop tightening alerts on all three of the signals which prevented full stop-outs. Not a single trade made it to a 1-point delta target. 3 Strikes Yer Out! The Market momentum dropped off and the system went dormant. Later in the session the market drifted higher into the close on weak momentum – low volume. (See Above) Today the sellers hammered the market for a brief period shortly after the open. The Momentum System detected the heavy selling pressure and issued 2 Short Alerts both which went on to follow-through into two easy Scalp Winners for an quick 4+ points at the 2 contract level. Friday’s we don’t stick around for long unless there is a rip-roaring trend in progress. (which are rare on Friday’s) After a 12 point run down from the open the market put in a bottom and then began a lazy retrace all the way back up into the morning quicksand zone where it clanged around for the remainder of the session. We got in quick during the first hour of price action, caught 2 winners and then momentum dropped out of the market. Both trades had very low draw-down compared to the nice 4+ plus positive price traction.